Many high-volume firms have a reputation of 'turning and burning' cases, which means that your case might settle quickly but it probably won't settle for what it's worth and you might not get the attention and service you deserve. By keeping our firm small and personal, we're able to take the time to build your case into what it deserves to be, which often means more compensation to you. At Gama Law Firm, we don’t “dabble” in other areas of law. 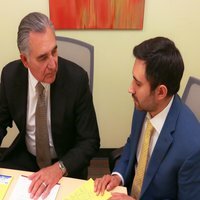 For a combined total of more than 60 years, Richard Gama and Joe Richard Gama have done one thing and one thing only: personal injury law. As the saying goes, “A jack of all trades is a master of none.” Our personal injury practice has one goal, and that is to inform and help victims of accidents and injuries caused by someone else’s negligence. We are active and respected members of the legal community, and we provide competent and aggressive legal representation for clients throughout Colorado and the Front Range. We are grateful for the opportunity to talk about your case, regardless of whether you decide to hire us or not. The phone call is free, there's no pressure to hire us, and we promise you’ll walk away with a better understanding of your rights. Many high volume firms have so many cases that their paralegals and legal assistants do most of the work. With us, we personally handle your case from start to finish. We successfully negotiate settlements for clients 95% of the time. But if the insurance company refuses to offer a fair value for your case, we will put our nearly 60 years of trial and litigation experience to work for you. Unlike some firms who just want to settle as many cases as quickly and easily as possible, we take the time to work up each and every case. Sure, we have hobbies, but our reputation depends on going above and beyond everyone else. Nobody knows your story better than you. One of the biggest mistakes an attorney can make is not listening to their client. After all, we can't effectively tell your story until we first understand your story. Other attorneys may promise things they KNOW they can't deliver just to get you in the door. We’ll shoot it straight. Even when it might mean losing you as a client, we won’t give you false expectations. If you do decide to hire Gama Law Firm, you and your case will get the personalized service and attention that you probably won’t find at a big downtown law firm. Set up a consultation with us, and we’ll answer your questions so you can focus on more important things, such as getting your health back. We are located in AURORA, CO, but we serve clients located anywhere in Colorado, including but not limited to the following counties: Denver, Adams, Arapahoe, Jefferson, Douglas, Elbert, El Paso, Pueblo, Boulder, Broomfield, Weld, Larimer, Clear Creek, Summit, and Eagle. No matter where you live, we are happy to come to you for your convenience. Richard Gama and Joe Richard Gama (former Arizona Superior Court Judge) have a combined 60+ years of experience in helping injured victims in both Colorado and Arizona get the compensation they deserve. Call for a FREE consultation with us and learn more about how we can help you get back on your feet after a serious injury.